As with so many things iPhone, there are multiple ways and places to access the same information or controls. The playback controls are no exception. In addition to the playback controls in Music on the Now Playing screen, there are three other ways to control playback: from the Control Center, using the headset remote, and with Voice Control or Siri. Swipe up from the bottom of any Home or app screen to open the Control Center. Adjust the volume and use the Rewind, Pause/Play, and Fast Forward buttons. Wake your iPhone by pressing the Home button or Sleep/Wake button and adjust the playback controls. Volume: Press the up or down buttons to increase or decrease the volume. Pause: Press the center button; press again to resume playing. Next song: Press the center button twice quickly. Previous song: Press the center button three times quickly during the first few seconds of a song to go back one song or return to the beginning of the playing song if more than a few seconds have passed. Answer the call: Press the center button. Decline the call: Press and hold the center button for a couple seconds; two low beeps indicate you successfully declined the call. Hang up: Press the center button. After you hang up, the music or audio you were listening to resumes playing where you were before the call came in. You can listen to music through a Bluetooth headset or speaker that you’ve paired with your iPhone. If the headset has volume buttons, you can adjust the volume with them. To listen to music with the iPhone speaker or another device, open the Control Center and tap the AirPlay button under Music; tap the device you want to use. 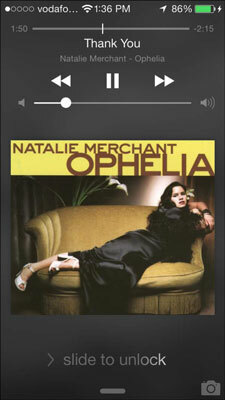 Open the song, album, or podcast you want to hear to see the playback screen. Choose the speakers you want from the list. If the speakers don’t appear on the list of AirPlay devices, check that both your iPhone and speakers are on the same wireless network. The music plays on the speakers you’ve chosen. 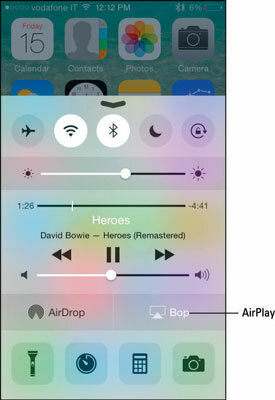 To switch back to play on your iPhone, tap the AirPlay button again and then choose iPhone. If your speakers or stereo aren’t specifically AirPlay-enabled but do support Wi-Fi or Bluetooth, you can connect them to your iPhone through the Control Center or Wi-Fi or Bluetooth in the Settings app. Press and hold the Home button until you hear a beep or Siri asks how she can help you. Siri recognizes music playing in the background, too, and you can ask the same types of questions to identify the song that’s playing. Siri works when you have either a Wi-Fi or cellular data connection. When these are unavailable, you can turn Siri off in the Settings app and use Voice Control to command the Music app. You can use the Clock app’s Timer feature to set music to play for a certain amount of time and you can choose a song as your alarm in Clock’s Alarm feature.